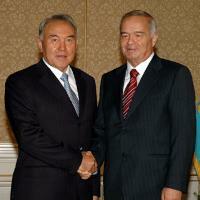 Islam Karimov, the president of Uzbekistan, just completed his first official visit to Kazakhstan since September 2006. In a joint media appearance following talks with Kazakh President Nursultan Nazarbayev, Karimov noted that the two countries are the most influential states in Central Asia. He correctly observed that, "Kazakhstan and Uzbekistan may play a crucial role in solution of a number of principal matters, connected with the stability in the Central Asian region and prospects of its sustainable development."